Three-handled Dicker vase - 5⅛" (130 mm) high. This picture nicely shows the 'oily road' effect produced by the pre-war glaze with lead content. The Dicker Pottery was established by Uriah Clark in 1843. He was assisted until his death in 1904 by his nephew, Abel, who then took over. In 1912 Dicker merged with the neighbouring Boship Green Pottery and became known as Uriah Clark and Nephew Limited. Production was hampered by both World Wars, but much interesting work was produced between the wars, including the black lustre wares for which the company is, perhaps, best known. During the Second World War the pottery was commandeered by the Ministry of Defence, and after the cessation of hostilities had extensively to be rebuilt due to the changes made by the military. The company passed to new management but never regained the position it held before the war. 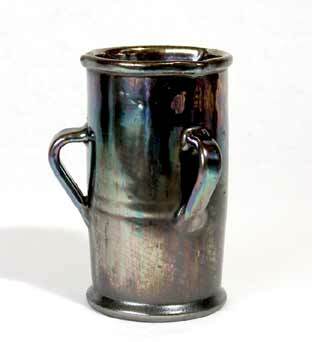 It was forced by legislation to abandon its traditional black glaze, due to its lead content, and use a substitute. Dicker struggled on until 1957. After its closure the Dicker tradition was carried on by Brickhurst Pottery and Merlin Pottery, both run by former Dicker employees. The name, 'Dicker Pottery' was bought by David Sharp and George Gray for Cinque Ports Pottery. Sharp experimented with the black lustre glaze, but didn't use it to any great extent.